INSANITY MAX:30 Results: Jesse Lost 44 Pounds! Jesse Gelbaugh lost 44 lbs. with INSANITY MAX:30. He entered his results into the Beachbody Challenge, and won the $500 Daily Prize for October 8th! My weight has always been up and down. I looked in the mirror around the holidays and was really disappointed with what I saw. I realized it was time to make a change. I was always chubby as a kid, and in high school, I lost around 30 pounds and gained all sorts of confidence. During college, I gained the weight back and then some. Since I have been out of college, my weight has been up and down. I wanted to get that confidence in my body that I once had back and keep it there. I wanted to finally complete a Beachbody program. I have started several, but due to work trips and vacations, I have never finished one start to finish. I was ready to do it for myself and get a shirt that shows how hard I worked. I wanted to get healthy and stay healthy. I realized it was time for a lifestyle change — not a few months of diet and exercise so I can go back to the way I was again. It was time to make a permanent change. Completing a challenge. I have done INSANITY and FOCUS T25, and got close to finishing both but never completed either. I was ready to finally say I finished a program start to finish and see the change. Taking pictures daily and weekly really helped me keep going, because I could see the change over time and it kept me motivated to keep going! Shaun T is inspiring and encouraging during the videos. He is tough on you but gives you encouragement along the way to keep you going. The idea of maxing out is great; it gives you a goal each time you do the workouts! I got great results in 30–45 minutes a day. I work a lot of hours so I needed a program that didn’t require a lot of time to complete each day. I don’t have motivation usually after work to exercise, so I wanted to do it in the morning. I wanted a program that gave me the “best bang for my buck” when it came to time so that I could still get as much sleep as possible. I am most proud of never missing a day. With previous programs, I would miss a day because I was tired. No matter what, I got up at 3:30 a.m. every day, did my workout, and managed to make it to work by 5:30 every day. I even made it through the first week when I had a terrible head cold, which made it very tough to do. The results have been great. I am seeing a better me in the mirror. The weekly pictures really show the change in my body. I am seeing definition where I once saw fat. I get compliments all the time on how great I look and how well I’ve done so far. 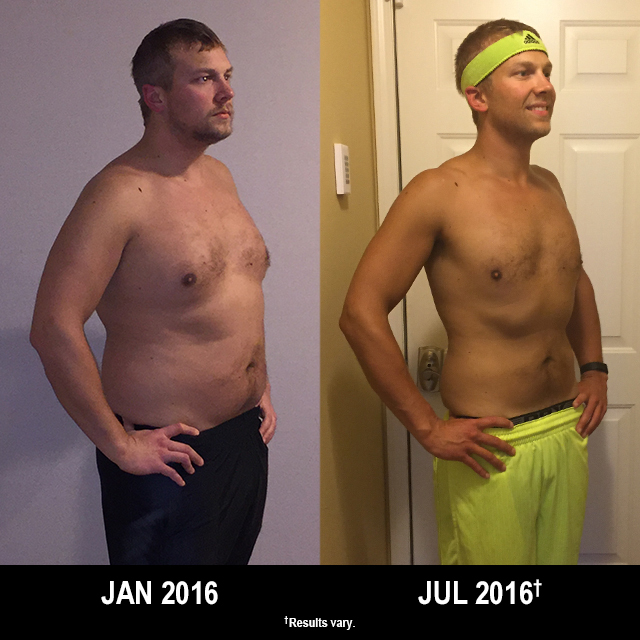 I am proud to show people my transformation photos and encourage them to do the same. I am more confident in my body, and am motivated to keep going and make myself better! I have now completed two rounds of INSANITY MAX:30, and am going after my third! I completed my first 5k in late April without training. I was amazed at my stamina for running just from doing INSANITY. I completed the race in 32:10, which was a lot better than I thought I would do. Since then, I have added running to my life and am participating in several more races this summer. I am also now training for a Tough Mudder race in September. I never in my life thought I would attempt one of those races. The program has given me confidence that I can do anything I put my mind to! She gave me support and advice when I needed it. She would check in with me on how I was doing and commend me on my progress throughout the journey. My blood pressure improved and my resting heart rate came down.2 With the proper diet, including Shakeology and exercise, I have not experienced heartburn at all anymore.2 I used to get it a few times a week.